Where to stay in Gig Harbor? That is the question! And answering it for yourself is part of the fun of coming to Gig Harbor. You'll have no shortage of options... from hotels to motels to small inns to tiny but personable bed and breakfasts, Gig Harbor has a place to stay for every traveler. The question then breaks down into a series of smaller questions: What? Where? How much? What type of lodging do you prefer? Hotel, motel, small inn or the comforts of home as manifested in a bed and breakfast? If you are the hotel type, select from the Inn at Gig Harbor or the Best Western Wesley, both located off our local "freeway" (Hwy 16). One of the jewels of the Gig Harbor lodging scene is the Maritime Inn, a small inn (just 15 rooms), located in the quaint downtown district, directly across the street from the public pier. 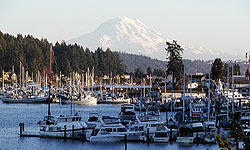 Walk to Gig Harbor's famous downtown restaurants, shops and art galleries from the Maritime Inn. Sorry, Gig Harbor offers none of the ubiquitous motel chains that dot the interstate highways. No Holiday Inn, no Travelers Lodge, not even a Motel 6 (though spokesman Tom Bodett lives here). In keeping with Gig Harbor's original atmosphere, our local motels are one-of-a-kind. If you want to park your car directly outside your room as you come and go, check into the Westwynd Motel Suites & Apartments. The Westwynd is an outstanding motel, offering comfortable rooms and convenient location, generally offering the best rates in town, and is also a great launching pad for exploring the Key Peninsula and Kitsap County while staying rooted in the Gig Harbor area. So those are your choices for hotels, motels and small inns. But it's just the start of the accommodations galaxy of the Gig Harbor/Key Peninsula area. Next, we explore the range of private residences offering you the chance to stay at home while you travel. The bed and breakfast experience! The Gig Harbor/Key Peninsula area has over 20 private residences available with friendly innkeepers ready to greet you as a member of the family. Where to stay becomes perhaps the most important question for your B&B hunt. Do you want to stay close in? Or would you prefer to get out into the countryside a bit... to the tranquility of our beautiful forests or waterfront? Decisions, decisions! On the north end of downtown, in what is known as the Finholm District, you'll discover one of Gig Harbor's newest B&Bs, the Waterfront Inn. As the name suggests, this inn is on the water, offering tranquil views of harbor, as well as private entrance, fireplace and jacuzzi for nearly every room. If you like the idea of staying on the water, but would rather move a bit further out from the busy harbor, consider Beachside Getaway, on a lovely beach on Fox Island, a 10 minute drive from Gig Harbor's commercial district. Here you'll enjoy the tranquil views with the Olympic Mountains across the water. You will stay in English cottage-style accomodations with full kitchen and romantic fireplace. Out on the Key Peninsula, about a 15 minute drive from downtown Gig Harbor, is Olde Glencove Hotel, overlooking Puget Sound. Built in 1896 and on the National Registered of Historic Places, Glencove Hotel makes for a fantastic romantic getaway off the beaten path. Other waterfront B&Bs in the area include Green Gables Edgewater, Harborside, Wesley Inn Beachhouse, and Pleasurecraft Houseboat Rentals docked in the harbor. One of Gig Harbor's newest - and oldest - Bed & Breakfast is the Parsonage, a charming, recently renovated home that dates back to 1901 as the home of one of the town's early ministers. Offering a taste of authentic Gig Harbor, the Parsonage is very conveniently located within walking distance of the downtown shopping district. If you are seeking peace and quiet... escape into the forest! Our recommendations for a relaxing stay in the trees would include Bear's Lair B&B, a gorgeous five acre country estate with beautiful gardens, a pond with island gazebo, unbelievable woodwork crafted by the owner throughout the home... and your own private carriage house to stay in if you like. The name of No Cabbages B&B should give you a hint as to the personality of this establishment, nestled in the forest just above Sunrise Beach. It's eclectic, it's fun, it's downright spiritual in the lush, rainforest-like setting that also includes a private guesthouse for your enjoyment. Though each of these B&Bs are hidden away in the woods, they are still just minutes from downtown. Speaking of pets... if you are traveling with your own pets, be sure to inquire whether pets are accepted at the lodging establishment of your choice. Pets are definitely welcome at the Westwynd Motel. Usually pets are not allowed at B&Bs. Vacation Rentals & Getaways -- Fix Your Own Darned Breakfast! If you're willing to forego the sumptuous gourmet breakfasts offered by the local B&Bs, and prefer something closer to a home of your own while staying in Gig Harbor, we recommend you consider Westbay Guest Cottage. Westbay, located on picturesque and serene Wollochet Bay, is a turn-of-the-century home that has been lovingly restored and updated. It's right on the water, a perfect place to relax... and just five minutes or so drive from Gig Harbor. Gig Harbor Beach Bay Getaway is located just a few minutes out of town on beautiful Henderson Bay. 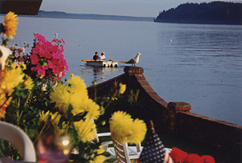 The Beach Bay B&B is "Romantic, Spectacular, Luxurious", and is perfect for full beach access, romantic walks and peaceful reflection, shell collecting, and watching for bald eagles, blue heron, osprey, kingfishers, ducks, seals and other Puget Sound wildlife. Arriving by boat? Tie up at the public pier right downtown, and the Maritime Inn and the Cottage at Gig Harbor are just steps away. The Waterfront Inn features its own dock on the north end of the harbor. Westbay Cottage has a deep-water dock available for you over at Wollochet Bay. Gig Harbor Beach Bay has a deep-water buoy just offshore that accomodate larger boats. We sincerely hope you enjoy your stay in or around Gig Harbor. Please let your innkeeper know that you discovered them at GigHarbor.Com, and let us know if you have any comments, recommendations or suggestions following your visit. We look forward to seeing you in the Harbor! Welcome to Gig Harbor and the Key Peninsula! Unbelievable views on the beach on Fox Island. on the shores of Henderson Bay. Historic B&B and great wedding spot. NOTE: All information is believed to be correct, however, check with the individual properties to verify. The banner ads below highlight the businesses that support this guide and are most ready to welcome you during your stay in the Gig Harbor/Key Peninsula area.